From the organizers of the successfully held 17th World Building and Construction Exposition, Worldbex Services International (WSI) comes up with another expo -- this time for the car enthusiasts called the 8th Manila International Auto Show (MIAS). 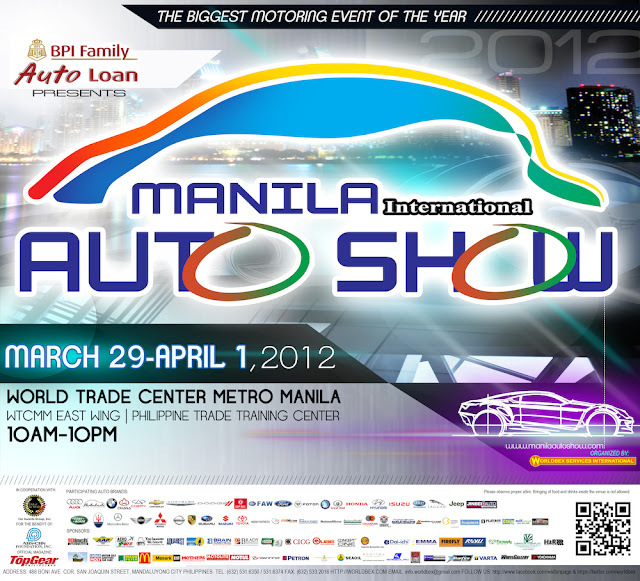 It's happening on March 29 to April 1, 2012 (Thursday to Sunday) at the World Trade Center (WTC), from 10am to 10pm. MIAS 2012 would feature the best concept cars, hybrid cars and many other automotive that will change the way we look at motoring and driving. With the theme “Motorsports”, MIAS 2012 turns the spotlight on “Life in the Fast Lane” and the current trend of developing new and updated models of sports cars by different car brands, all designed to out ride the competition. MIAS merchandise can also be purchased at the venue, with items such as shirts, caps, USB hubs, baller IDs, and other MIAS 2012 novelty items. Why go to MIAS 2012? For the past seven years, MIAS has averaged an 85,000 attendees annually. This year is bigger and better with 110 companies occupying the WTC, the Philippine Trade Training Center, the adjoining WTC East Wing and the specially constructed WTC East Wing B, with the total exhibit area now at 30,000 sqm. The 8th Manila International Auto Show is important since it aids in effectively boosting local car industry, especially with BPI Family Bank’s Auto Madness, which offers low interest rates for car buyers during the show. For more information, call (+632) 5316350, 5343615. You may also email: info.worldbex@gmail.com or visit www.worldbex.com. I have been looking forward for these car shows. I'll keep visiting for more of your posts.